Enemies: No enemies of their own, but they suffered as bystanders in a battle between their superpowered friends and Sat-Yr-Nin's troops. formerly a council house in a slum estate somewhere in London. (Mighty World of Marvel#15/1 (fb) - BTS) - Joan's husband, Josie and Micky's father, left the family under undisclosed circumstances. Micky in particular, took it badly, and began mixing with "the wrong crowd". (Mighty World of Marvel#14/1 (fb) - BTS) - Josie and Micky Scott encountered and befriended Meggan, who was hiding out in some warehouses near their home. She explained to them that in spite of her lupine appearance she was a mutant, not a werewolf, although the full moon did affect her reasoning. For a number of months the two youths tried to help her, bringing her things (presumably food and clothing) and helping her to stay calm when the moon was full. Micky and Josie visited Meggan again on March 18th, the night of another full moon. While Meggan tried to retain control, a passing tramp (Sidney Crumb) drew her attention. She told the Scott siblings that he "stunk, like a dead animal". (Mighty World of Marvel#14/1) - Unable to bear the smell, Meggan attacked the man, their respective screams drawing the attention of Captain Britain. He pursued Meggan into her warehouse hideout, where they had a brief skirmish before Meggan regained enough control to recognise her opponent and break off the fight. 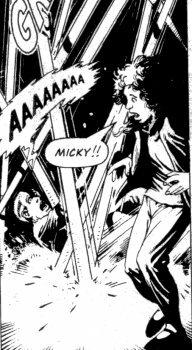 Searching the darkened building for his foe, Captain Britain heard a noise, and swung around to grab a figure behind him, only to discover it was a teenage boy, Micky. He and Josie introduced themselves, and tried to explain about Meggan. The confused mutant watched this, and in her befuddled state decided the hero was hurting her friends. She resumed her assault on Captain Britain, unable to hear Josie call for her to stop. As the two superhumans battled, they smashed into scaffolding, which began to collapse. Realising the danger, Josie called for her brother to run, but before he had a chance to move, he was pinned beneath falling metalwork and killed instantly. Coming back to her senses, Meggan fled in anguish; as tears began to stream down the grieving Josie's face, Captain Britain freed the dead teenager's body from the debris, and cradled the corpse in his arms. (Captain Britain II#1/1 (fb)) - Micky's death was reported in the national press, notably in the Daily Mirror. 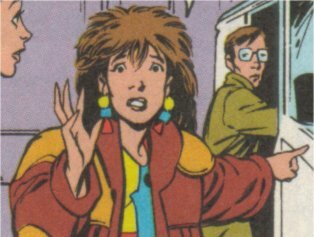 (Mighty World of Marvel#15/1 (fb) - BTS) - Guilt-ridden, Meggan watched Josie's house every day after Micky's death, wanting to explain why she had lost control, but too scared to approach. She watched as visitors came; police, friends, and undertakers, but seeing the Scotts so upset, could not bring herself to come forward. The police and the courts ruled the death an accident. About a week after he died, the Scotts buried Micky. (Mighty World of Marvel#15/1) - The Scotts returned home from the funeral. As Joan put the kettle on, there was a knock at the door. Joan called to Josie, asking her to answer it, but Josie refused, sparking off a brief row, which ended when Josie accused her family of blaming her for Micky's death. Realising the grief was in part to blame for their short tempers, Joan hugged her daughter and answered the door to find Captain Britain standing outside. The hero explained he had come to apologize for causing Micky's death, but Joan refused to accept his culpability, stating that she had lost Micky long before, when he went off the rails after his father left; "It was only a matter of time." She invited the hero in, before he attracted too much attention from the neighbours, and told him to call her Joan, rather than "Mrs.Scott". She introduced him to her father-in-law, Bob, who expressed his admiration for various acts of heroism Captain Britain had undertaken in the last week. Seeing that the superhero seemed downcast and oblivious to the praise, Joan stopped her father-in-law's monologue and offered their visitor a cup of tea. As she prepared it in the kitchen, Bob asked Captain Britain about his prolonged absence from the country, asking if he had gone to America. When the hero informed him that he had been back in Britain for the last six months, Bob enquired why he hadn't been back in action during that time, as a lot of people had needed his help. This provoked an angry outburst from Josie, who insisted they didn't need him, and accused the hero of being an establishment stooge, interfering in other's lives because he felt he had power. 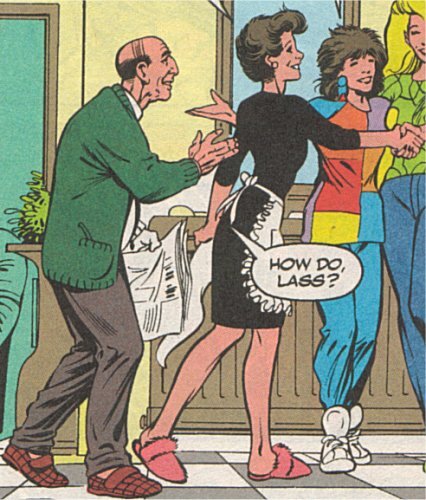 Joan, returning from the kitchen with a tea tray, berated her daughter for this rant, but Captain Britain interrupted her, and stated that Josie was right; his last few years of "rubbing shoulders with cosmic beings, fighting to save the universe" had made him forget his duties to ordinary people, and it had taken Micky's death to remind him. Joan insisted he was being too hard on himself, but Captain Britain was not so sure; he had persisted in fighting Meggan even though he knew bystanders were nearby. At this mention of Meggan's name, Meggan herself replied. She had seen the hero's arrival, and been listening outside. His remorse had spurred her to finally come forward; she informed Captain Britain that it was her, not him, who had caused Micky's death. Josie enthusiastically greeted her friend, but Meggan waited nervously for everyone else's response. Joan informed both Meggan and Captain Britain that she had accepted the court's ruling that Micky's death was an accident, and they should too. She berated the Captain for his exhausted appearance, suggesting he was pushing himself too hard in an attempt to stop feeling guilty. He responded by stating that he had failed Micky, and would not fail anyone else again, but Joan pointed out that no one individual, however powerful, could deal with all the world's problems; all anyone could do was live their life and try to help others along the way. Then Joan told Meggan that, since she was Josie's friend, she was welcome in their house, and offered Captain Britain another cup of tea. 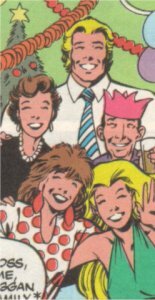 The family and their new friends had a lengthy conversation, partially easing the guilt and grief all of them felt, and Captain Britain and Meggan gradually opened up to them. The hero discussed his extra-dimensional adventures, with Joan picking up on his attraction to Saturnyne (and Meggan showing a pang of jealousy), and Meggan informing them of how she had lost contact with her family, and of her vague memories of her imprisonment during the Jasper's regime. Hearing this, Captain Britain offered to let Meggan stay with him while he tried to help her locate her family. As the overjoyed Meggan hugged Josie, four armored figures materialized above them and opened fire. Captain Britain shielded Joan with his own body, while Meggan pushed Josie to safety, then together they ripped into the mysterious attackers, making short work of them. Upon defeating their opponents, Captain Britain and Meggan were shocked when their downed foes simply vanished from their grasps. Then they realized they had demolished the side of the Scotts' house, leaving a gaping hole. Captain Britain worriedly checked to ensure the family were uninjured, then apologized to Joan for the damage. Unperturbed, Joan pointed out to the penitent hero that he had only been defending himself, and that he should look on the bright side. When he pointed out their house was ruined, she replied that the council would have to rehouse them, which would finally get them out their slum neighbourhood. As the stunned hero took this in, Joan asked if anyone wanted some more tea. (Captain Britain II#1/1 (fb) - BTS) - The Scotts were swiftly rehoused on the much-sought after Bellingham Estate, the publicity surrounding their circumstances causing the keys to be handed over to them by councillor Robert Varney at a public ceremony on the steps of the local town hall. (Excalibur I#44 (fb) - BTS) - For a time, Captain Britain and Meggan were like family to the Scotts. The hero revealed his true identity as Brian Braddock to them, and the group spent at least one Christmas together. Eventually though, Brian began to worry that being involved with the Scotts was putting them at risk of constant danger, so he stopped visiting, though he continued to write, send cards and flowers. (Excalibur I#44) - Meggan took her Excalibur team-mate Rachel Summers to visit the Scotts, as she hoped Josie might remember something which would help Meggan locate her parents. While Joan and Rachel shared a cup of tea in the living room, Josie went upstairs with Meggan to catch up on gossip. Rachel told Joan she considered Brian, who had recently had a fight with Meggan, to be an insensitive jerk, but Joan explained that this was not the case; Brian simply wasn't a spontaneous person. Clearly missing her friend, Joan asked Rachel to pass on her regards to Brian. Meggan came back downstairs to inform Rachel that Josie had told her the local gypsies had been moved on, but that one had gone legitimate and set herself up as a fortune teller, Madame Zelda. Josie took the two visitors to Zelda's shop, and waited outside while Meggan went in; she subsequently witnessed Rachel's confrontation with Micromax and F.I.6 in an antiques shop across the street. After this the two superheroes walked Josie home. (Excalibur I#125 - BTS) - The Scotts presumably attended Brian and Meggan's wedding in Otherworld. Comments: Created by Alan Davis and Steve Craddock. The date given for Captain Britain's encounter with Micky and Josie, his fight with Meggan, and the death of Micky, is explicitly given as being March 18th 1984 (night time). The year has to now be considering a topical reference, but there is no reason to presume the actual day and month should be. Captain Britain's reminiscing tells us it has been around six months since the Jaspers Warp storyline. Bob mentions that the British public had not heard much from the hero in the last six years (which would take us back to his original comic strip ending in 1978), and the hero mentions that he has spent the "last three years" fighting to save the universe, which ties in with his real-world appearances in British comics. Clearly, at this point in his history, Captain Britain's adventures are being treated as happening virtually in synch with real time in the real world (overall, not on an issue-by-issue basis). However, given Marvel's sliding timescale, all these periods (with the possible exception of "six months since the Jasper's Warp") have to be taken with a pinch of salt. It's not clear how Micky's father "left" the family. The choice of phrase does not support the idea that he died, and if he simply abandoned them, Bob's presence with his daughter-in-law's family would suggest that he didn't agree with his son's actions. Perhaps the father was sent to prison? It's also not clear what Joan meant by Micky "mixing with the wrong crowd". 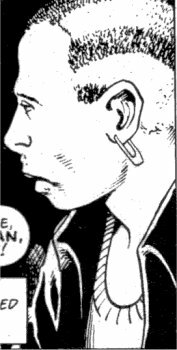 True, Micky's appearance suggested he was a punk, but considering Joan took Meggan's animalistic appearance in her stride, she doesn't seem the kind of person who would be too thrown by a son who got into a few piercings and shaving his head. I'd guess he fell in with gangs, especially given the run-down nature of the housing estate the family was living on. 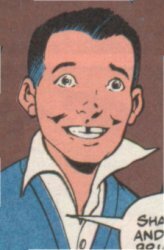 We don't actually see the Scotts anywhere in Excalibur I#125. However, given the wedding party included some of the team's enemies, I really think the Scotts had to be in attendance, and their lack of visible presence was an oversight on the part of an artist and writer unfamiliar with the Meggan and Brian's histories. Bob was the father-in-law of Joan and the grandfather of Micky and Josie. He seemed to be a big fan of Captain Britain's exploits, stating they made him feel proud to be British. He felt "trouble with folks today is no patriotism", which he stated wasn't the case when he was young. Unlike his daughter-in-law, he found the appearance of both Meggan and the armored thugs startling. When Meggan brought Rachel to visit, he was notably appreciative of the leather mini-skirted telepaths' looks, but he fell asleep in his seat while Joan chatted to Rachel. Mother of Josie and Micky, daughter-in-law of Bob. She was a centred woman who handled life's surprises and tragedies with fortitude and composure. The loss of her son upset her, but she did not blame others for what she saw as an accident, and her pragmatic but compassionate viewpoint helped both Brian and Meggan through their own guilt. She later helped Rachel understand Brian better, pointing out the flaws in the telepath's negative view of her team-mate. The sister of Micky, daughter of Joan and grand-daughter of Bob. With her brother, she befriended Meggan, and she was present for Meggan's moonlit battle with Captain Britain, witnessing her brother's death. The pain of her loss made her lash out initially, but she was clearly pleased when Meggan returned. By the time Meggan brought Rachel to visit, Josie had left school and gone to university, her cat had produced kittens, and she had a new boyfriend. Micky was the son of Joan, grandson of Bob and brother of Josie. According to his mother, he had fallen in with a bad crowd after his father left. He and Josie befriended Meggan, and for months helped her survive in her warehouse hideout. During the battle between Meggan and Captain Britain, he was killed when several pieces of falling scaffolding landed on him, impaling him.